On this Easter Sunday, Christians celebrate the Resurrection of Jesus, Jews observe Passover, basketball fans await the final contest of the Final Four and baseball fans look forward to the start of the new season. After Friday’s disappointing report of job gains in March, investors might be wondering what will happen Monday when markets in the U.S. reopen following Good Friday. In overseas markets, yields on the 10 year Treasury bond fell on the employment news. Job gains that were about half of expectations helped allay fears of a June rate increase. We may see a positive response from both the bond and equity markets on Monday as the time table for rate increases might start in September. On the other hand, the weekend might allow more rational judgment to prevail. One month’s disappointment does not a trend make. 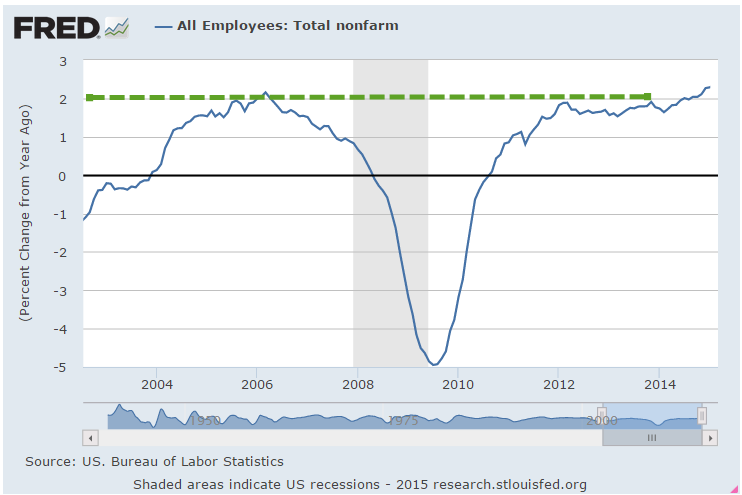 Year over year gains in employment are especially strong. April is usually a good month in the stock market. Since breaking the 2000 mark in August, the index has neither gained or lost much ground. Gains in the technology companies that are included in the SP500 (Apple, for example) have been offset by losses in the oil sector of the SP500 (Exxon, Chevron, for example). Long term Treasuries (TLT) have risen 10% in the past six months, despite the prospect of rising interest rates in 2015. ICI reports that domestic long term equity mutual funds had an outflow of about $8 billion in March. Investors have not abandoned equity funds by any means but have changed focus. During this past month, $14 billion flowed into world equity funds. Bond funds continue to post strong inflows – $10 billion in March. The boomer generation amassed a lot of pension promises through their working years. Pension funds must balance both equity and bond risk in their investment portfolios and yet try to meet their assumed growth rates of 7% – 8%. Caught on the horns of this dilemma, pension funds straddle both the equity and bond markets. During the past ten years, many have become underfunded because they have not been able to match their projected growth rates. This delicate balance of risk and reward sets the stage for a catastrophic decline in response to even a relatively small monetary shock because pension funds can not afford to wait out another three or four year decline. Too many boomers will start cashing in those promises accumulated during the past decades. The relatively low number of new jobs created in March was probably due to the severe winter in the eastern part of the country. The BLS revised downward their previous estimates of employment gains in January and February. Even with the downward revisions and this past month’s relatively anemic 126,000 gains, the average for the quarter is still about 200,000 per month, a particularly strong figure when one considers the impact that plummeting oil prices have had. In the first 3 months of this year, companies in oil and gas exploration have shed 3/4 of the jobs added during all of last year. The strong dollar makes U.S. exports more expensive and hurts manufacturing. The employment diffusion index in manufacturing industries dropped below 50, a sign that there is some contraction in the 83 industries included in this index. However, March’s Manufacturing Purchasing Managers Index showed some slight expansion still and employment in manufacturing is still strong. Across all private industries, the diffusion index remains strong at 61.4. Fed chair Janet Yellen has repeatedly said that interest rate decisions will be based on data. If the data of subsequent months show a resumption of strong growth, an interest rate increase at the FOMC meeting in late July could still be in the cards. The CWPI composite built on the PMI anticipated a declining trend in growth this winter and spring before resuming an upward climb. When the non-manufacturing PMI is released this coming Monday, I’ll update that and show the results in next week’s blog. Based on the numbers already released, I do anticipate a further decline in March then an evening out in April. The particularly strong dollar has cast some doubt on growth predictions, particularly in manufacturing. Both oil and the dollar have made sharp moves in the previous months and it is the rate of change which can be disruptive in an economy. New claims for unemployment were the lowest since the spring of 2000, just as the bubble of the dot-com boom began to deflate. 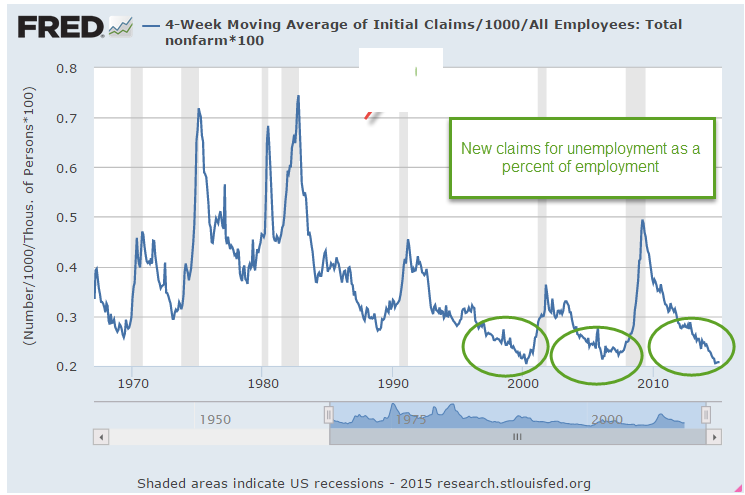 As a percent of those working, this is the third time since WW2 that new claims have reached these very low levels. The last two times did not turn out well for the economy or the stock market. Going back through some old notes. Here’s an October 2009 article where Deutsche Bank estimates the price of oil at $175 in 2016. 2009 was just about the time that newer techniques in horizontal drilling were being developed. The fracking boom was just about to get underway. Whether you are an investor or a second baseman, the future is tough to figure out so stay balanced, stay prepared and keep your knees bent.